The cake is a white/pink marble cake, and the top layer is chocolate and the bottom is whipped cream icing. The rest is all fondant (except the tiara and the black ribbons!). I used the cricut cake for the lettering. I'm happy with how it turned out.... except!.... I need to practice on not getting fondant folds and creases on the side, and how to properly pipe icing. Otherwise, this was a good test run for my next cake for her on the actual party day. The cake is on fire! No, not really... but it was cool to see that sparkler fly! 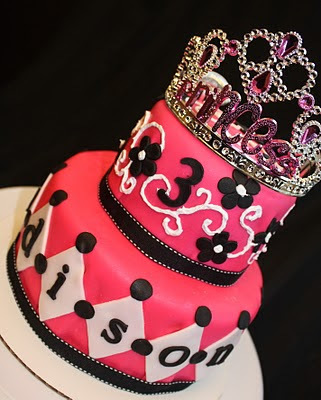 Just loved Adison's 3rd birthday cake a lot. I am in love with all of the colors used and yeah the design is definitely unique. I too have to find some decent theme inspirations for my son’s upcoming birthday bash. I want to make this party very special so won’t mind booking the kids’ friendly event venue NYC. LET THEM EAT CAKE!!! CAKE CAKE CAKE CAKE CAKE!! !